On June 22, 1954 the first industry and press demonstration of the Todd-AO process took place at the large Stage 2 at Metro-Goldwyn-Mayer in Culver City (CA). 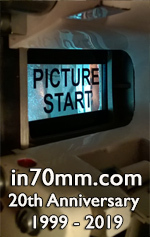 Test footage projected in 65mm: A test sequence from "Oklahoma!" directed by Fred Zinnemann and filmed by Robert Surtees ASC and Harry Stradling, ASC one of which were filmed August 3, 1953 on the MGM lot. The roller coaster Atom Smasher filmed at Rockaway Playland near New York photographed June 15, 1953, a bull ring in Madrid and the canals of Venice photographed June 9, 1953 all directed by Michael Todd and photographed by Harry Stradling (Notes 4 + 7). The MGM screen measured 51 by 25 feet (15,5m x 7,6m). The curve had a depth of 13 feet (4m). The overall curve measured 60 feet. At the screening were Brian O'Brien, Michael Todd, Richard Rodgers & Oscar Hammerstein II, Fred Zinnemann and Jan J. Kotte. Dr Brian O'Brien explained how "The curve helps to develop the illusion of audience participation and peripheral vision". Joseph Schenck (Head of Magna Theatre Corporation) also attended and said that "Oklahoma!" would be road shown in 45-50 theatres in Todd-AO before being reduced to 35mm film.